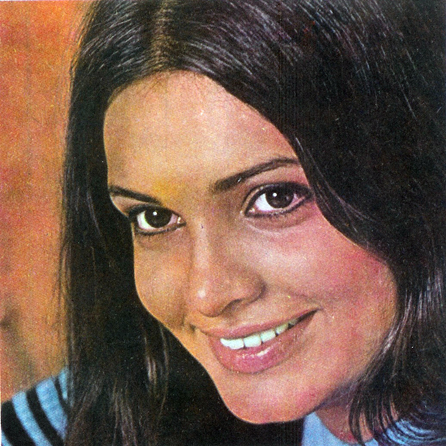 Reader Shaila pointed out yesterday that I have neglected Parveen Babi here at MemsaabStory (Bullet being her only featured film). Doesn’t she look sooooo young? Reminds me a little of Ali MacGraw in Love Story. I will try to do better on the Parveen front. Posted on September 1, 2008 at 9:00 am in Hindi movies, Vintage Bollywood images	| RSS feed You can skip to the end and leave a reply. Can we continue with your RK fix which ALSO has the gorgeous Parveen and is a Bhappi Soni– “Chalta Purza” next plizz?!!! I have Chalta Purza, but the DVD stopped playing halfway through >:( Pet peeve! I was so excited about Parveen Babi and RK in a Bhappi Sonie film too! She resembles young Dimple Kapadia and young Zeenat Aman. But I got to say she looked prettier than both of them. Too bad she died so young and the men in her life didn’t treat her right. I used to get confused between Zeenat Aman and Parveen Babi as a kid! The resemblance was so close that she was even called the “poor man’s Zeenat Aman” though I think she was the better actress of the two. Also check out “Woh Lamhe” if you haven’t already – it’s loosely based on Parveen Babi’s life and affair with director Mahesh Bhatt. Wow, first “Arth” and now “Woh Lamhe”? Sigh, will someone make a movie about the positive aspects of her life and career? She was one of my favorite actresses when I was growing up, mainly because I was a huge Amitabh fan and saw all their films together – Deewar, Amar Akbar Anthony, Shaan, Kaalia, Mahaan, and a whole bunch more, probably a dozen in total. I’ve seen half of Ashanti (then the DVD failed)…am hoping to see the rest of it soon though. Parveen was always good with Shashi Kapoor too…I loved her in Suhaag. Amit: it’s like the Marcia vs Jan Brady Bunch debate :-) Zeenat or Parveen???? that might be an interesting post. Thanks a ton…you are simply wonderful…again a request if I may say so…please please also write something about another gorgeous tragic beauty, Madhubala or simply put the venus of Indian cinema..
Maybe I’ll do the Madhubala-Shammi film Boy Friend soon. It was a good one. Parveen was one of the best actress and she was the first actress with high qualification entering into bollywood. I saw several movies including Ashanthi & Chalta Purza with Super Star Rajesh Khanna. i heard that she was extremely Intelligent!!! Well, she was the classiest of all the actress with her killer jaws and well defined cheekbones.